We manufacture & stock two sizes of Z section posts which were developed for Highways use and in use on roads and motorways all over the UK. As you would expect from a post designed for high speed motorway impacts, Z section posts have great strength for the amount of steel in them and they provide a tremendous performance / cost balance. Whilst they are not as rigid as the RSJ posts, Z section posts offer cheaper solution where impact severity and frequency is not a critical issue. 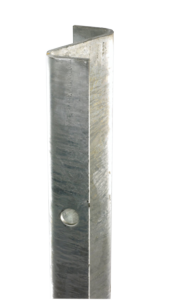 110 x 50 x 5mm – This is the Z section posts used on the motorways and was designed for high speed impacts at 20° angles. It is expected to deflect or bend in these impacts to soften the blow for the vehicle occupants but still contain the vehicle. They are a low cost option for lighter applications. 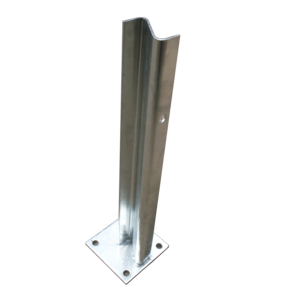 125 x 90 x 5mm – These Z section posts were originally used in barrier systems on A and B roads and are the ones often seen used on the barrier on bends in the road. A heavier duty post whilst still representing good value.